Some soldiers were trying to move a heavy log of wood without success. Their leader was standing simply watching as his men struggled. A rider passed by and asked him why he was not helping. He said, “I am the corporal. I give orders.” The rider went up and helped the soldiers lift the wood. With his help, the task was accomplished. The story brings us to three key characteristics of great leaders. Leaders take actions: They don’t wait. They don’t just talk or order. The join their team whenever they feel the need. Imagine the morale of the team when its leader joins the team members and works with them to achieve something. Leaders optimize resources: Leaders make the most of the resources – time, finances and human beings – that they have at their disposal. They keep an eye on all the three. Leaders are excellent managers in this sense. A leader has to be a good manager though the reverse is not necessarily true. Leaders Inspire: This is the most important quality of leaders. They inspire people/teams with their vision, commitment and actions. Leaders trust their team members/followers. Their communication is inspirational too. They don’t just discuss ‘what’ is to be done, they discuss ‘why’ it is to be done and what ‘impact’ it would bring in. People give out their best when they know that their individual effort is linked to a bigger goal. A young Japanese man wanted to learn martial art. He went to the best teacher of the time. Meeting the teacher he asked, “how long must I study in order to become the best in martial arts?” The teacher said a minimum of ten years. The young man thought it was too long. So he asked the teacher, “What if I studied twice as hard as everyone else? How long would it take then?” the teacher said, “twenty years.” Running out of patience, he asked again, “What if I worked day and night with all my effort, how long would it take then?” “Thirty years,” was the teacher’s response. I shared the above well-known story to expand on the profound response of the teacher that actually tells us why we don’t patiently pursue our dreams. We want to achieve results quickly and that dilutes the focus on efforts. Patience is the ability to accept delays, obstacles or challenges without getting annoyed or disappointed and persevering with the effort to achieve the goals. 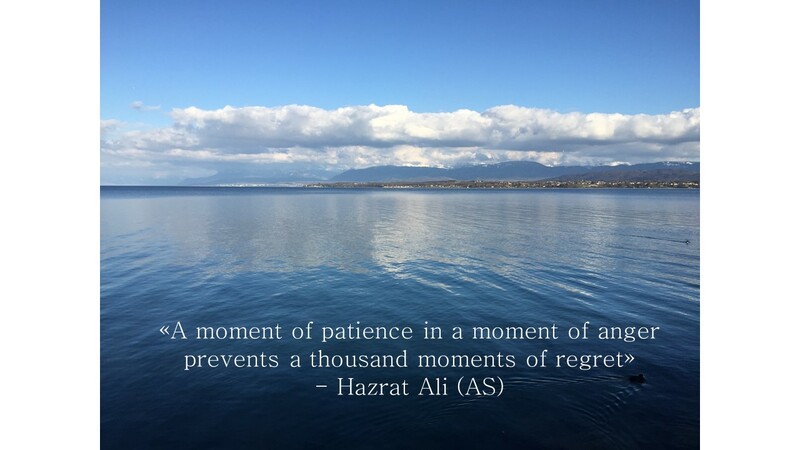 How can we develop patience? It could be anything like prayers not being answered, efforts not yielding the desired results, delays in flights, being stuck in a traffic jam, delay in food being served in a restaurant etc. Identify the situations in which you normally lose your patience. Reflect on your impatient behaviour in different situations. And, then think of the outcome of that behaviour. You might regret your instant reaction out of anger, frustration etc. This realization would prepare you to respond differently next time such a situation arises. Things don’t always go as planned. There are unforeseen situations or some other facts that can cause delays and irritate you. It will be good to think ahead and plan for at least those factors that you can think of. For example, while learning a new skill, tell yourself repeatedly that everything is difficult before it is easy. For avoiding traffic jams, see if you can factor in some extra time in your schedule. Patience is key to success. 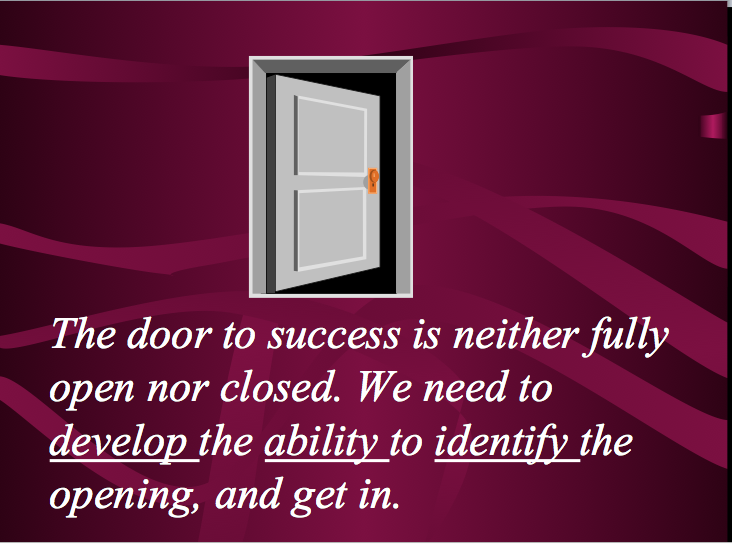 It is an attitude that we all must develop. Problems of life are like the red light on a traffic signal. If we wait, light becomes green. Let’s learn to wait. Phil Knight, the founder of Nike, in his book — Shoe Dog: A Memoir by the Creator of Nike — shares some invaluable insights on success. Knight’s first job was to sell encyclopaedias. He did not have much success. His second job was to sell securities. He did not do well here either. Just when he was beginning to lose faith in his ability as a sale person, he set up Nike and started selling shoes. According to Phil Knight, he succeeded this time because he was selling a product he believed in, and liked. Knight had been an athlete on his college team. He loved running. He knew how important a good pair of shoes was to a runner. This made him a credible shoe salesman, and the rest is history. Knight’s personal life story reinforces the point that secret of success lies in doing what you like doing. Knight was not failing as a salesman, he was just not selling the products that he was interested in, or had the passion for. The moment he got to sell shoes, he excelled. Everyone is not as fortunate as Knight to find a job or a career of his liking, though it is worth trying. Not everyone is daring enough to make a career transition either. As a result, there are people who have the aptitude for selling shoes remain stuck in selling shampoos. They struggle to deliver the results and don’t reach their peak. And, this affects their self-esteem. No one likes all aspects of his/her work. We have only two choices: Either dare to change or find relevance in the work we do. Finding relevance means we should see the connection of our work with a higher level goal. Pursuing a worthwhile goal most often gets the best out of us. In one of my earlier posts – Managing Self-Esteem at Work – I had made a few suggestions. Contentment comes in finding relevance in things we do; and in pursuing goals that give a sense of satisfaction. Since Knight had been an athlete himself, he did not just sell shoes, he believed in making shoes that would help sportsperson achieve their dream. This led him to constantly work on improving the design and features of his products. I have a friend who runs for 5 kilometres a day, seven days a week. Weather does not affect his schedule. It may be too cold, too hot, raining or snowing, he finds a way to go out and run. And, he has been doing it for 23 years. People like him who strictly follow a schedule to achieve their goal are few. We see a much larger number who start something and then give up. Drop out rates in gym and fitness centres, hobby courses, sport and training courses are always high. Why is it that some people follow a plan of action and achieve their goals but most don’t? I asked my friend what keeps him going. His answer was simple, “I enjoy it and actually look forward to running every day.” This sounds too simplistic but if you think it is a profound idea. If we are pursuing something that we look forward to doing, we are more likely to do it. For example, in a weight loss programme, there are several options. A person who likes to socialize will not enjoy running alone on a treadmill. He might be better off playing a sport of his choice, walking with a friend, and doing other group activities. A key point that we often miss is that every success comes after a long process of continued failures in our chosen path. Short and task-specific goal like walking 10,000 steps a day is better in this context as well. It reduces the chances of failures. Even if you do less on a few days, it does not matter. You don’t feel the same sense of failure as you would if you had set yourself a goal of losing 3 kilos in a month. The final point: we should not allow ourselves exceptions and excuses like not finding time, having too much of work etc. I worked with a consultant recently. We had an important meeting to prepare for and worked till 11 in the night. When we finished and I was looking forward to go to sleep, he told me was going to the gym because he did not want to miss his workout. That should be the spirit. New Year Resolution: Do make one! The countdown to 2017 has begun. It is time to wish each other a happy new year; and make resolutions. Making New Year Resolutions is an ancient tradition. Ancient Romans used to begin each year by making promises to Janus – the God after whom the month of January is named. Over time the concept evolved and the resolutions moved into the mould of self-improvement. Now, we find them in the arena of enhancing knowledge or skills (like learning a musical instrument, a new language etc. ); doing things for family/improving relationships (like going on a family trip, spending time with children/parents, forgiving someone); and taking care of health (like quitting smoking, going for exercise to loose weight) etc. A 2007 study from University of Boston found that 88% of the people who make New Year’s resolutions fail. Top two reasons for this are: setting unrealistic goals; and not keeping track of the progress. Why should one make New Year’s Resolutions when they are more likely to fail? The fear of failure should not stop us. There is an inherent element of failure in all plans. Isn’t it? A successful person is the one who sets realistic goals, makes plans to achieve them and executes them as best as possible. So, go head and do make a New Year’s Resolution for 2017. Instead of being overwhelmed by the majority, get inspiration from the 12% people who did succeed in achieving what they had resolved to do. Be with the achievers. Make a new beginning. Don’t let the failures of past affect your determination to succeed. Forgive those how have hurt you. Forgiveness will not only improve relationships, it will free you of bitterness and negativity and you will be able to pursue your dreams with full energy. I wish all a very happy and successful 2017. May it open new doors for you and bring peace in the world. When faced with a problem, you have two options: do something to solve it or do nothing. Everyone will agree that we can’t let it go and do nothing. We need to do something to get out of it but not everyone does it. Why? A man once saw elephants that were held by a small rope tied to their front leg. He wondered how such huge creatures can be held only by a small rope. They could break the rope any time but, for some reason, they did not do that. Most of the time, we don’t even make an effort to do something because we are conditioned to believe that this is the way our life is destined to be. We need to change this fatalistic attitude. We need to break the rope that holds us captive. The real challenge is that the ropes that hold us captive in our life are not visible. In most cases, they get developed as a result of life’s experiences, circumstances, setbacks, broken relationships etc. As time passes by, we get “conditioned” to accepting the life as it is; and stop making efforts to improve it. Success is not about what you achieve. It is about achieving what you are capable of achieving. But does anyone know what he or she is capable of achieving? Not really! This is the concept that Joe De Sena presents in his book – The Spartan Up! The book is co-authored by Jeff O’Connell. Spartan warriors of ancient Greece have inspired generations. They trained hard for years. Their motto was: never be satisfied with what you achieve. In 1972, Walter Mischel, a Stanford researcher, gave his child subjects their preferred treat—a marshmallow, cookie, or pretzel but with a choice: They could eat the treat right away or wait 15 minutes, at which point they could receive two. The researchers found that those kids who were willing to postpone gratification became more successful adults than those kids who couldn’t. Joe puts it well: success is a by product of delayed gratification. This is so true. When we look around we find so people who look successful, yet they are not happy. They are not happy because they have not realized their full potential. They felt satisfied too early in life, stopped running after achieving a milestone. You may not win every race or overcome every obstacle but each attempt can be a profound learning experience. Joe’s ideas are not just tips from a self-help guru. As he relates his own adventures of Spartan races, his ideas are more inspiring. It tells you the recipe to success and emphasises the importance of hard work. The Spartan Up! – is not just to be read- its concepts are to be applied in life – by all. You are currently browsing the archives for the Success category.